In Jacob Bronowski’s classic BBC series and companion book, The Ascent of Man, he follows a modern Persian nomadic tribe, the Bakhtiari, and uses them as an illustration about what humanity is like without civilization. The nomads, like prehistoric peoples, constantly, chronically live at the very edge of survival. So despite their weaving, their language, their traditions, and all the things that make them human, they have not risen far above the animals: every day, all day, is a struggle to get through the next day, the next season, the next year. Everything these nomads own, they carry. There is no time for science, art, literature, and certainly not for physical comfort. And there is no progress or prosperity. These nomads are, in the very strictest meaning of the word, conservative: everything they do is done as it was by their ancestors a thousand, perhaps ten thousand, years ago. Their skills do not change, their songs do not change, their customs do not change. Most importantly, their ideas do not change. Anything in their lives that has changed or improved, is the result of civilization and progress elsewhere. Those living on the edge simply don’t have time or resources to invest in anything new, in anything that does not contribute to the next meal. That’s not a knock on conservatism, but rather, on extreme conservatism. Extreme conservatism and extreme liberalism are both unattractive, and for different reasons, unworkable. So it’s an argument for moderatism. To our concerns here, it is also a comment on luxury, and compassion. At one point in Bronowski’s narrative, he describes the rigors of crossing a treacherous river, and that the elderly may decide not to attempt it. They simply stay behind to die. In a poignant turn of phrase, Bronowski notes, “Only the dog is puzzled to see a man abandoned.” It seems brutal, inhumane, but to do otherwise, to stay and offer assistance, or to try to bring along anyone who cannot contribute, means danger and possibly death for the whole tribe. We think of compassion and human dignity as universals, we insist that they are ethical and moral imperatives. 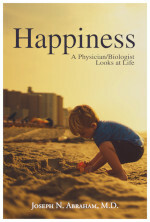 As much as we might wish otherwise, as much as some of our greatest philosophers have argued otherwise, they are not. They are luxuries. So if we think compassion and human dignity are desirable and even wise, we must create them, and we must defend them. And as we work for justice we must remember that, for some people today, and for the great majority of our history, our concepts of what is ethical and moral represent impossible luxuries. Compassion, equality, and defense of the weak are very modern ideas. We cannot make our world better by ignoring the hard realities that many people have faced, and that many still face today. Continue with Compassion as Luxury II. 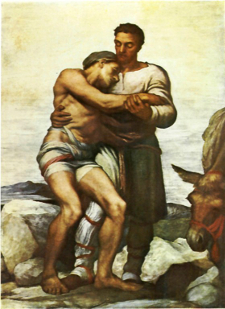 Image: George Frederic Watts, “The Good Samaritan” courtesy WikiMedia.org. Perhaps compassion and justice are relative to culture. It seems to me that leaving someone to die at the end of life does not mean there is no compassion or justice. Could it not mean that the end of life (or when life begins) may be defined differently by different cultures?